When we were little we used to go to my grandma’s house every Sunday afternoon. Like clockwork. This used to be a typical Sunday tradition. Your homework had better be done and “no, you cannot go play with your friends because we’re having sauce at 2 and going to grandma’s house at 4”. It was one of my favorite times of the weeks and I miss having everyone in the house at once, 14 different conversations going on, being apart of at least 5. Yelling and hollering with glee. But we grew up and moved out, went off to college, got married, had kids, got jobs so understandably, not everyone can get there every week anymore. We try to make it as much as possible, but life gets in the way. This weekend my cousin was in from Oregon whoever could make it to grandma’s house to visit piled in. It was nice to have us all together again. Laughing and talking. My grandma force feeding us….one of her finer qualities. 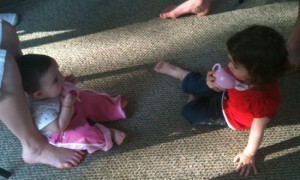 Cardin and Alivia even got to enjoy a spot of tea together. They really enjoy each other’s company. Alivia talks up a storm when she sees Cardin and Cardin wants to watch and ‘help’ you do everything from feed to change Alivia’s diaper. When we leave, Cardin will ask about “liv-a” for a good solid hour”. I know that I’m lucky to have been able to be surrounded by my cousins when we were growing up. So, I’m grateful they can grow up and play together. I’m sure they will make quite the duo once Alivia starts walking.